Here’s a tricky question: What do you do with fennel fronds and stalks? Sure, everyone loves the fennel bulbs. They’re delicious thinly shaved into salad, or roasted with parmesan until they are luscious and creamy, but what about the rest of the plant? You spent money on the stalks and fronds, so you might as well use them! I love using the fronds just like I would any other herbs. They have a delicate flavor, so it’s best if you just toss them into a dish at the end of cooking, like in this delicious Pasta with Sausage & Fennel Fronds. I’ve also chopped ’em up, sautéed in some olive oil, and thrown in a frittata with other veggies and herbs I had on hand. Get creative! 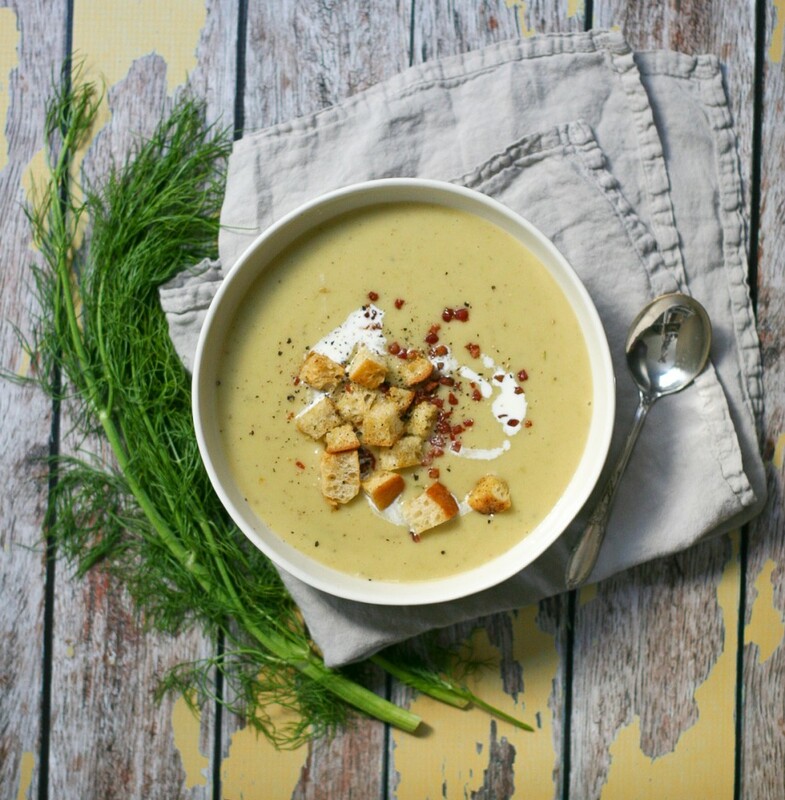 I personally think fennel goes great with potato, so into creamy potato soup the stalks went! 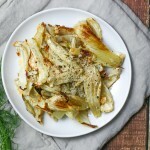 If you’re new to fennel, this recipe is a great introduction. The stalks are sautéed with the onions to provide a flavor base to the soup. Since the stalks are cooked, their anise flavor mellows out completely and gives the soup just a nice hint of flavor. Not overwhelming at ALL. 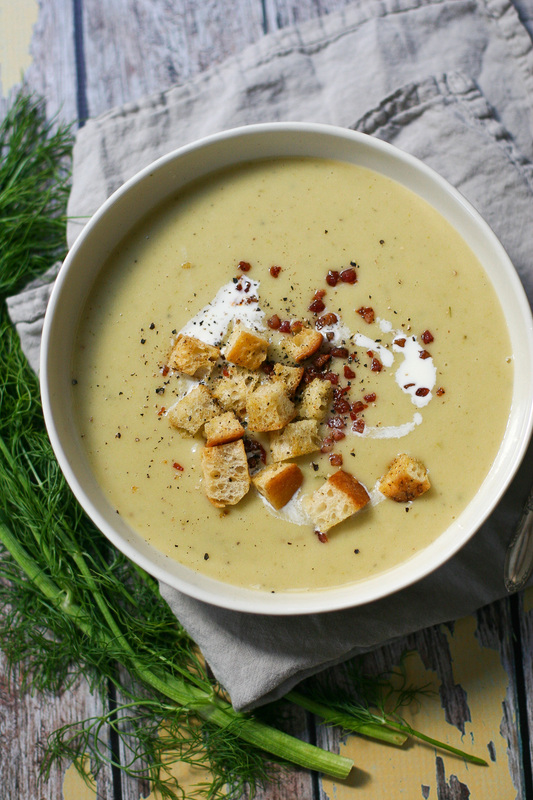 This creamy, decadent soup is a nice treat. Yes, it’s loaded up with whole milk and cream, but it’s the perfect balance to the starchy potatoes and PANCETTA CROUTONS. It’s pretty life changing. 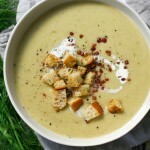 I may never top my soup with regular croutons again. 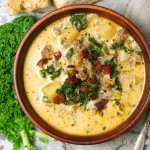 And don’t skip the toppings, creamy soups like this are begging for some textural contrast to liven up each bite. Garlic bread croutons & crispy pancetta fit the bill perfectly. Enjoy! First, make the croutons. Preheat the oven to 350 degrees Fahrenheit. Place the cubed bread and pancetta on a rimmed baking sheet and toss with olive oil, garlic powder, ground black pepper, and salt. Once the croutons are evenly coated with oil and seasonings, shake the pan to distribute evenly, and bake in the oven for about 25 minutes, or until the bread is nicely golden and the pancetta is crisp. Turn off the oven, remove the pan, and set aside until later. Meanwhile, start the soup. Melt the butter in a large dutch oven over medium heat. Add the onion, fennel stalks, 1 teaspoon salt, and 1 teaspoon ground black pepper and sauté for about 10 minutes, stirring occasionally, until the vegetables are softened and just slightly starting to brown. Add the garlic and sauté for another minute or two, stirring often, until fragrant and softened. Add the potatoes, stock, and bay leaves and bring to a boil. Reduce the heat to a simmer, partially cover, and simmer for 20 to 30 minutes, or until the potatoes are completely tender. Remove the bay leaves, then puree with an immersion blender or in batches in a blender. 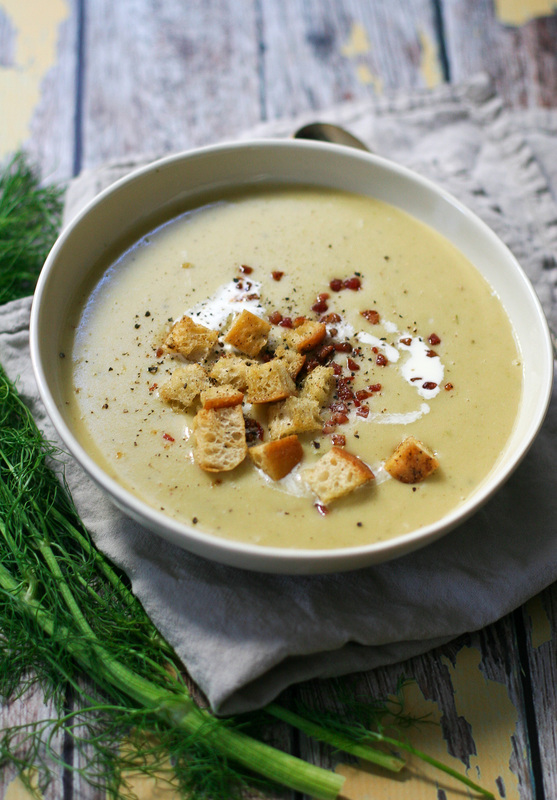 Stir in the milk and heavy cream, season with salt and pepper to taste, and serve with the crispy pancetta croutons. 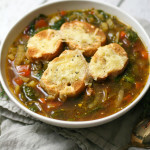 This soup is on the heavier side, so it goes well with a simple side salad or other light veggie side.